Pollyanna may be the most famous fictional Vermonter for now, but a new publishing venue, Brattleboro-based Green Writers Press, could change that. Its mission is publishing new works by Vermont authors, including a forthcoming collection of short fiction. Titled simply Contemporary Vermont Fiction, the anthology will feature stories set in Vermont by writers who also reside there (or once did), including Mosher, Megan Mayhew Bergman, Robert Olmstead, Joseph Bruchac, Miciah Bay Gault and Suzanne Kingsbury. GWP founder/publisher/managing editor Dede Cummings and editor Robin MacArthur are reaching out to other Vermont-based writers for potential inclusion. In addition to celebrating the state’s literary terroir — with five titles on the verge of release — GWP is committed to a green business ethic. 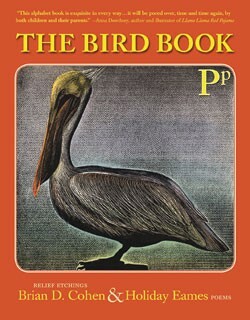 Cummings calls on her experience as a former senior book designer at Little, Brown and Company and her present work as a literary agent to publish books “for those who care about the fate of the Earth and want to do something about it.” In line with that mission, GWP’s first title, The Bird Book — a children’s alphabet book by a Westminster Station couple, illustrator Brian D. Cohen and poet Holiday Eames — was printed by a Springfield company using soy-based inks on “tree-free” paper made from postconsumer waste pulp. Future books will use print-on-demand technology and offer e-book versions. Fans of Pollyanna or current fiction and green activists alike are invited to The Bird Book’s publishing party this Friday in Putney.